I took a leap in time back to 1920’s Los Angeles, when most people did not yet own a personal automobile. Stairways carried people through the hilly neighborhoods and the Pacific Electric “Red Car” electric railway system took them from home to the urban center. I went on an urban exploration of the Secret Stairs of Silver Lake, #23 “Astro Loop”, as presented in Charles Fleming’s wonderful book “Secret Stairs: A walking guide to the historic staircases of Los Angeles“. It is a delightful tour through 1920’s Los Angeles. 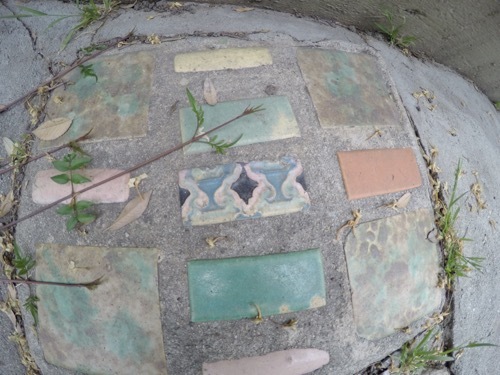 As I was admiring some beautiful art deco era tiles artistically cemented into the first set of “secret stairs”, a local resident reverently mused that those tiles were “the old way”. How touching that the masons who built these stairs took care to build beauty into the infrastructure of a growing city. The Astro Loop also follows the historic corridor of the Pacific Electric “Red Car” electric trolley line that shuttled passengers from Downtown to Glendale and Atwater Village throughout the early 20th century. What can only be experienced outside of a guide book is the cool hipster vibe that permeates the atmosphere of Silver Lake. It is alive with individualism and unselfconscious expression.